My first triathlon in a year and first race post-Logan is in the books. 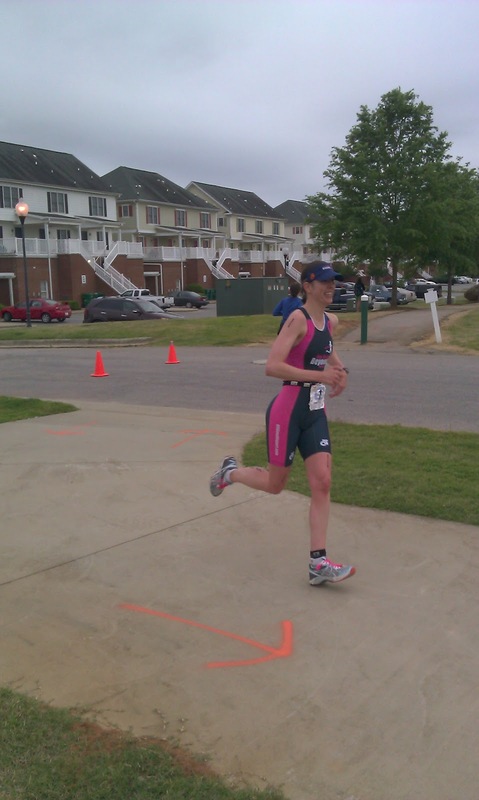 My last triathlon (where I was 7-8 weeks pregnant with Logan) was almost 1 year previous at the Triangle Orthopedic Sprint. I did a couple of 5K's and open water swims while pregnant but I wouldn't really say they were races so they don't really count. Here are the results if you'd rather just see them and not hear me blah blah blah about the race. Last year I decided that the Riverwood Sprint Triathlon would be a great first race back. 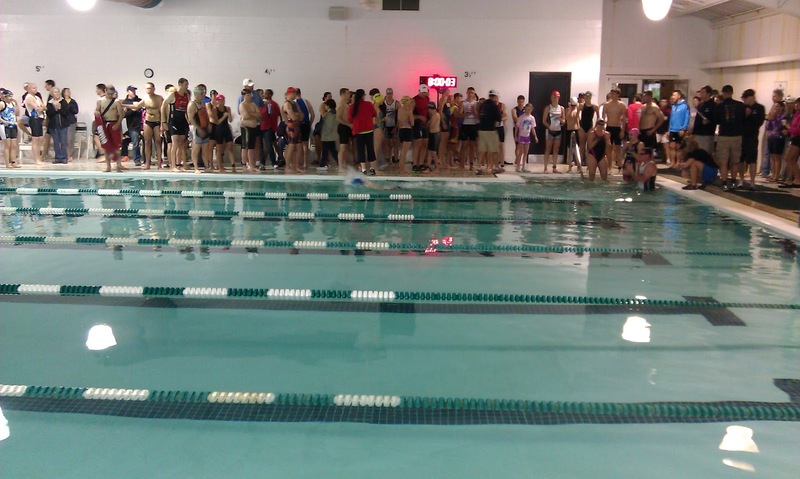 It was a small race, with a pool swim, that was geared more towards beginners. Sign me up. Marty did and put in a really fast pool time which 'earned' me the right to start the race in first position. Let's be clear about something - my swim stinks right now. While pregnant I kept swimming, but pretty much just splashed around and since having Logan I haven't been swimming all that much. Swimming has never been my forte and I'm getting to the pool about 3 times every 2 weeks - this leads to a competent swim, but by no means fast. Anyways, my biggest concern was getting passed in the pool, but luckily the guy behind me was around my speed so in the end I exited the pool still in first position. I hit the wall in just under 4:00 so for 300 yards that is right around 1:20 pace. Oh yeah. But back up. Racing a triathlon with a baby in tow adds a whole new element to everything. 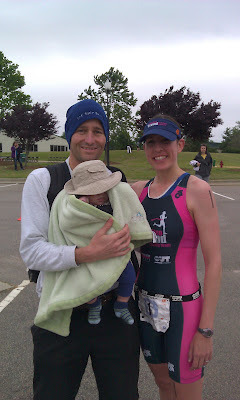 Triathlon is already very gear intensive and then add in a baby and you've got a whole bunch of crap to pack up. I did most of this on Friday so I didn't have to worry about it in the morning. Then of course I have to add in time to pump. Then I got ready, ate, did last minute prep and then got Logan up. Poor kid, who wants to get woken up from a deep sleep at 5:30 am? 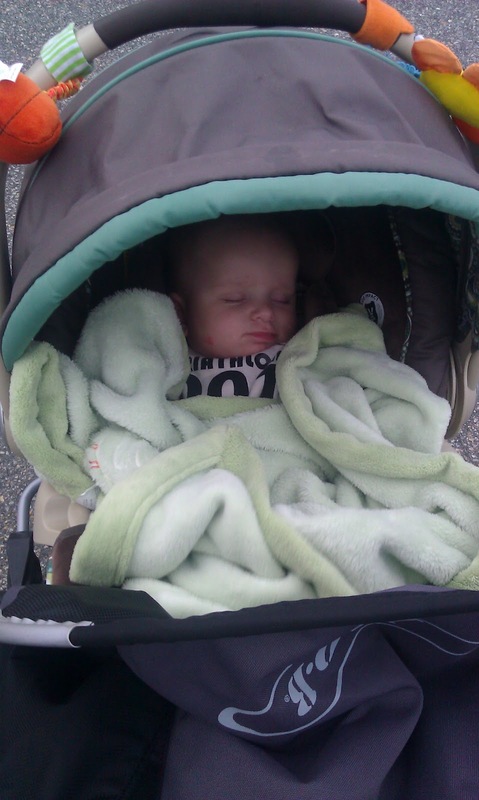 We were sort of hoping we could transport him right to the car and head out but he wanted to EAT. We made it to the site in plenty of time, and I had already picked up my packet so no worries there. 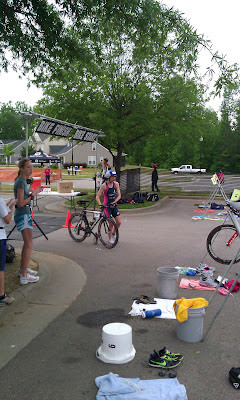 I had to make sure to fit in another pumping session because I wanted to be sure everything was out before the race. So maybe this is TMI but it's my life right now and it's quite a commitment! But since we're on the subject, this milk factory is beginning it's shutdown this month. My goal was to breastfeed for 6 months which would be Jun 12 -- and I have a bunch stored so I should get there. I am so ready to be done though, and can't wait until I am. Breastfeeding is great and I applaud women who manage to do it for the whole year but I am so over it and will be glad to be done. Back to the race. 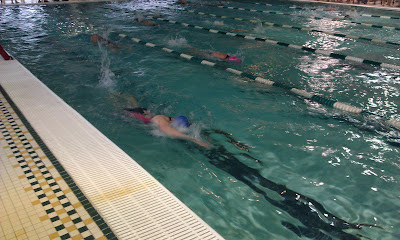 My friend and athlete Cari decided to race at the last minute and it was fun to have her right next to me on the rack and in the pool to warmup. It was also handy since she had an extra cap for me when mine broke right when I went to put it on. I did a short jog warm up and the calf felt okay - a bit tight but not debillitating. Onto the run and this is what I was most worried about since this stupid calf injury has cropped up. Not only had I not been running very much but I had pretty much done only one workout (on the Thursday before the race). Luckily, the calf held up. It was tight but not bad. 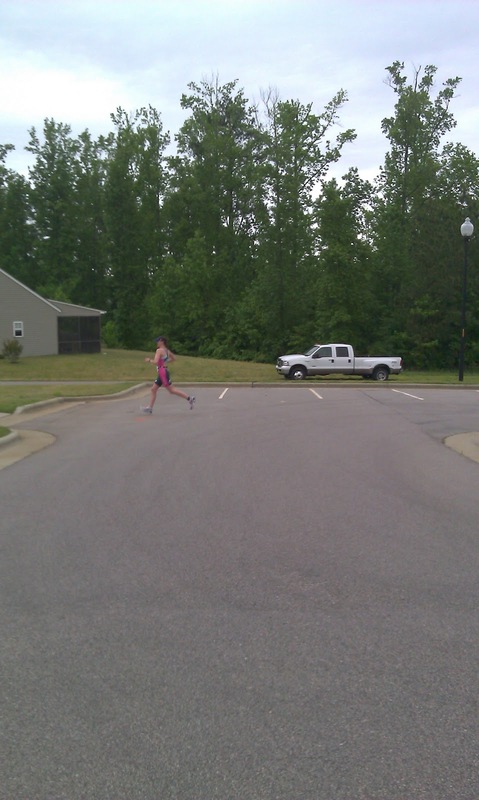 The run course was nice, on a greenway along a river for a bit, then into a neighborhood and back on another greenway. It was hilly coming back so definitely not a fast course. The last hill before the finish line was a killer and it was impossible to get your speed back up after it. 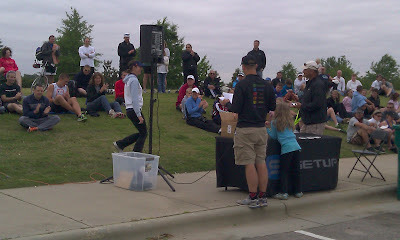 I can't complain about winning the race - it was so fun and I'm so happy to be back out there. Of course, I'm nowhere near where I was once but I wouldn't expect to be. 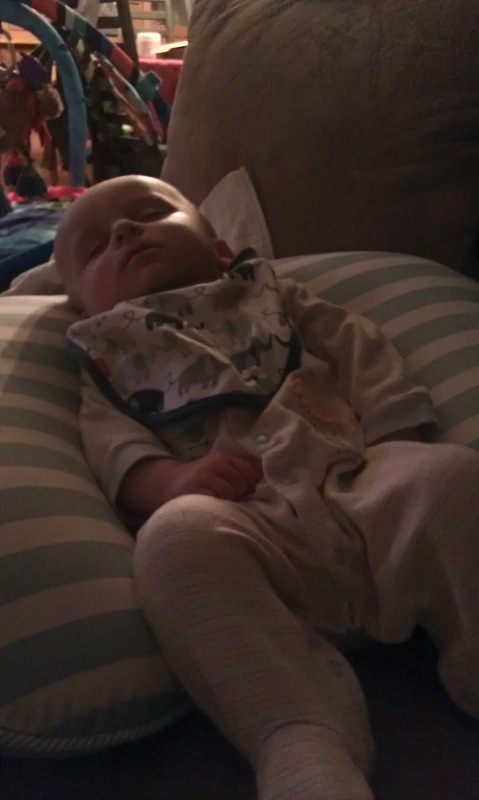 Getting some extra sleep the night before. Heading off to set up my junk. Great job Bri!! I totally get the breadtfeeding. I was that way with Piper and am that way with Tatum now. I don't go back to work until August so I'm trying to hang in there until then with the nursing and then see how long I pump. :) good for you for making it this long though!!! 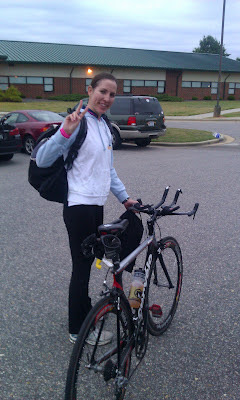 And congrats on your first race (and win) back!! You're doing great! All the extra planning & packing involved with a baby, and you still get it all done and win the race. Congratulations! Congrats! I am with you on the breastfeeding. I am totally over it and still have months to go. 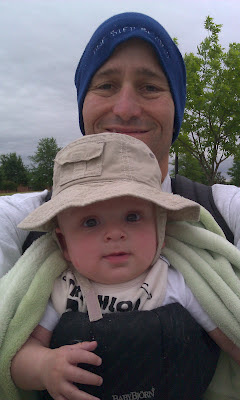 I made it 9 months with Zach - but was supplementing. We'll see how long I make it this time.